alaTest has collected and analyzed 14 reviews of LG V30S ThinQ. The average rating for this product is 4.1/5, compared to an average rating of 4.3/5 for other Cell phones for all reviews. Views about the portability and durability are overall positive. The reliability and design are also appreciated, but some have doubts about the price and size. We analyzed user and expert ratings, product age and more factors. Compared to other Cell phones the LG V30S ThinQ is awarded an overall alaScore™ of 90/100 = Excellent quality. The LG V30S ThinQ is a confusing and rather disappointing revision to an already excellent smartphone, which didn't really need updating at all. LG Electronics has unveiled the V30S at Mobile World Congress 2018. The Android-based handset can connect with LG's home appliances. LG presented the V30S and V30S+ ThinQ models at the Mobile World Congress in Barcelona. We tested out the device as well as its new AI CAM, but the V30S+ tells us more about the V30 rather than taking a major leap forward in development. LG V30S Hands-on: What's different from the regular V30? LG V30S First look: LG V30 vs LG V30S. LG has just launched a new version of the LG V30, but what's new, what's the price, and should you upgrade? What to do when your next smartphone proper isn't ready? LG decided to re-release its V30 with tiny updates. 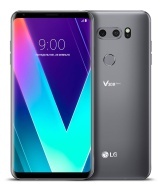 Does it fix any of the original V30's problems?